Efficient pH regulation is a fundamental requisite of all calcifying systems in animals and plants but with the underlying pH regulatory mechanisms remaining largely unknown. Using the sea urchin larva, this work identified the SLC4 HCO3- transporter family member SpSlc4a10 to be critically involved in the formation of an elaborate calcitic endoskeleton. SpSlc4a10 is specifically expressed by calcifying primary mesenchyme cells with peak expression during de novo formation of the skeleton. 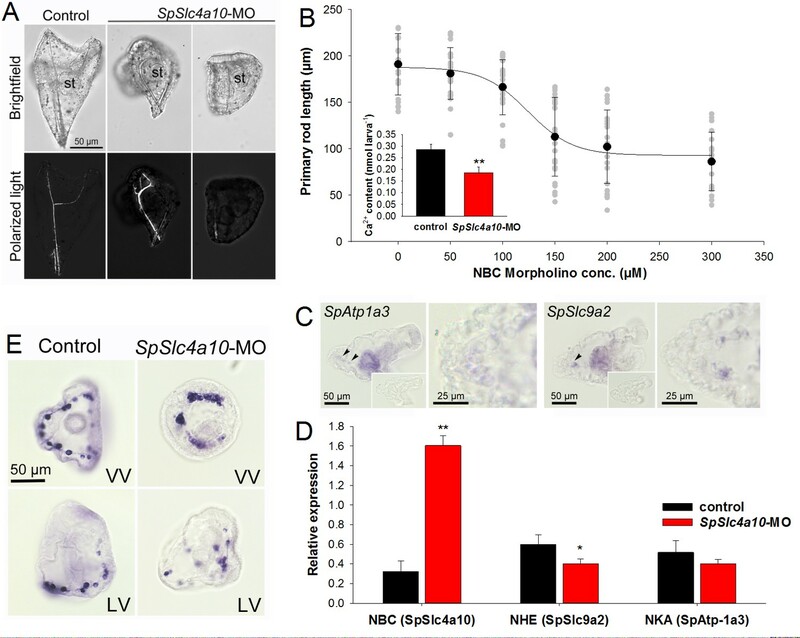 Knock-down of SpSlc4a10 led to pH regulatory defects accompanied by decreased calcification rates and skeleton deformations. Reductions in seawater pH, resembling ocean acidification scenarios, led to an increase in SpSlc4a10 expression suggesting a compensatory mechanism in place to maintain calcification rates. We propose a first pH regulatory and HCO3- concentrating mechanism that is fundamentally linked to the biological precipitation of CaCO3. This knowledge will help understanding biomineralization strategies in animals and their interaction with a changing environment. Many marine organisms such as mussels, sea urchins or corals, have skeletons and shells, which – due to their beautiful colors and shapes – are often desirable collector pieces. These structures are made from calcium and carbonate ions that react to form calcium carbonate crystals in a process known as biomineralization. In sea urchin larvae, for example, the skeleton is built by so-called primary mesenchyme cells, which work similar to the bone forming cells in mammals. These mesenchyme cells use calcium from the sea water, which travels to the site where the shell starts to form. About half of the carbonate comes from carbon dioxide that the animals make as they breathe, but it is not known how the other half gets to the site of biomineralization. Producing a skeleton generates acid, and marine animals need to be able to regulate their pH levels, as too acidic environments can dissolve the calcium carbonate and threatening to destroy the developing shell. How cells accumulate enough carbonate to make their shells, and how they cope with acidity is still poorly understood. Here, Hu et al. address this problem by studying purple sea urchin larvae, revealing that they use ion transporters to gather bicarbonate from seawater. These structures are part of a group of bicarbonate transporters known as the ‘SLC4 transporter family’, which sit across the membrane of the mesenchyme cells and move the bicarbonate ions along. As the sea urchin larvae develop, the levels of the transporter protein start to rise in mesenchyme cells, peaking around the time they are producing the skeleton. Stopping the production of the transporter hindered the larvae from building normal skeletons and also made their cells more acidic. It turns out that bicarbonate is more than a skeleton ingredient – it also helps to buffer the acid made in the process. Bicarbonate ions can combine with acidic molecules to form water and carbon dioxide. Bicarbonate pumped in from the sea neutralises the acidic molecules made during calcium carbonate formation, which helps to stabilize pH levels. When the acidity of the water was experimentally increased, it prompted the sea urchins to produce more of the SLC4 transporters, revealing that they may have another role to play. Their acid-neutralizing capability helped the animals to cope with changes in their environment. Taking on more bicarbonate could therefore help to compensate for rising acidity, allowing skeleton production to carry on as normal. This last finding is important in the context of ocean acidification. As the amount of carbon dioxide in the atmosphere increases, more of the gas dissolves in the sea. The chemical reactions that follow make the water more acidic and decreases the pH levels of the sea. Understanding how animals make their skeletons and shells, and manage acid, could reveal how they will cope as the environment changes in the future. Sea urchin larvae with their elaborate calcareous endoskeleton have been studied by embryologists for over a century to promote our understanding of calcification in biological systems (Boveri, 1901; Decker and Lennarz, 1988; Wilt, 2002). Similar to mammalian osteoblasts that arise from mesenchymal stem cells (MSC), the sea urchin larval skeleton is also produced by a specific cell line – the primary mesenchyme cells (PMCs) (Wilt, 2002). During the blastula stage, PMCs ingress into the blastocoel and migrate in a stereotypical pattern, forming a posterior ring around the blastopore (Ettensohn, 1990; Gustafson and Kinnander, 1956). 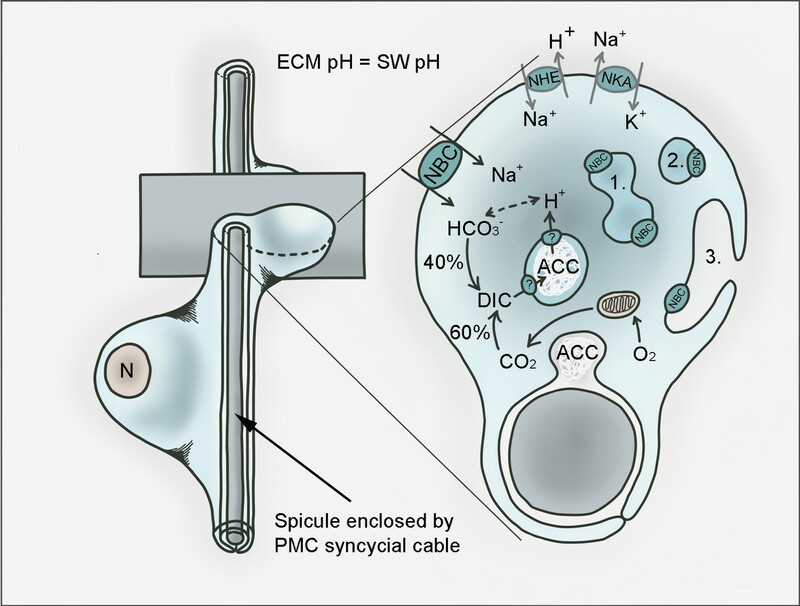 Amorphous calcium carbonate (ACC) is precipitated within intracellular vesicles that exocytose their content into the lumen of a syncytial cable formed by the PMCs. This process involves at least 40 distinct skeletal matrix proteins supporting the formation of the mature calcite spicules within this extracellular space (Beniash et al., 1997; Benson et al., 1986). Some of these matrix proteins are also present in intracellular compartments where they may play a role in the stabilization of ACC (Urry et al., 2000; Wilt, 2002). Furthermore, recent findings suggest that Ca2+ also enters calcification vesicles by endocytosis of seawater into a vesicular network within the PMCs (Vidavsky et al., 2016). During de novo formation of the larval skeleton in the mid-gastrula stage, calcium uptake increases ten-fold, compared to the blastula stage. 70% of this calcium is incorporated into the newly formed spicules (Nakano et al., 1963), while the remaining 30% reflects the uptake of calcium into cell organelles, including mitochondria and the smooth endoplasmatic reticulum (Decker et al., 1987). Besides the availability of Ca2+, dissolved inorganic carbon (DIC, i.e. CO2, HCO3- and CO32-) is required at equimolar levels for the precipitation of CaCO3. Radioisotopic measurements demonstrate that up to 63% of carbon for spicule formation derives from respiratory CO2, while the remaining DIC that is incorporated into the spicules derives from seawater (Sikes et al., 1981). Based on the assumption that HCO3- rather than CO2 or CO32- supplies the remaining 37% of DIC for calcification, 1.6 protons are generated per molecule CO32- precipitated. An even stronger local acidification at the site of ACC formation can be expected considering CO2 as the major source of DIC. Based on these calculations, it has been suggested that PMCs are capable of efficiently handling this proton load using pH regulatory mechanisms (Sikes et al., 1981). However, such potential acid-base regulatory mechanisms in PMCs remain poorly understood despite their importance in the formation of the larval skeleton. A previous study demonstrated that pHi regulation of PMCs is dependent on external Na+ as well as HCO3- to compensate for an intracellular acidosis indicating Na+-dependent HCO3- buffering mechanisms (Stumpp et al., 2012). The importance of HCO3- transport in the calcifying PMCs is underlined by the observation that DIDS (4,4´-diisothiocyano-2,2´´-disulfonic acid stilbene), an inhibitor for most SLC4 family transporters (Romero et al., 2004) inhibits uptake and deposition of 45Ca into spicules (Yasumasu et al., 1985). Accordingly, it has been concluded that these compounds block the supply of HCO3- for ACC formation rather than the ability of PMC cells to form their syncytium as shown for other blockers (Basse et al., 2015; Mitsunaga et al., 1986). Furthermore, H+-export pathways involving Na+/H+ exchange were suggested to remove protons from the cytosol of PMCs although amiloride, an inhibitor for Na+-dependent H+ exchange had no effect on spicule formation and pHi regulation of PMCs (Mitsunaga et al., 1987; Stumpp et al., 2012). Here, we hypothesize that HCO3- transport pathways, via a so far unidentified HCO3- transport mechanism affect the calcification process in different ways: (i) HCO3- transport supplies the cell with substrate for the precipitation of CaCO3 and (ii) the regulation of intracellular HCO3- homeostasis is critical to buffer excess protons generated by the intravesicular precipitation of CaCO3. Apart from an endogenous generation of protons through biomineralization, pH regulatory mechanisms of sea urchin larvae have received considerable attention in the context of CO2 driven sea water acidification (Byrne et al., 2013; Stumpp et al., 2012). The sea urchin larva has been extensively studied with respect to their potential for physiological acclimation and evolutionary adaptation to predicted near-future ocean acidification. These studies suggested that energy allocations and ion regulatory efforts are key processes that determine the resilience to reductions in seawater pH (Pan et al., 2015; Pespeni et al., 2013; Stumpp et al., 2012). These studies also indicated that despite moderate impacts at the organismal level, the compensatory reactions at the cellular level are substantial. Thus, a better mechanistic understanding for cellular processes affected by changes in seawater pH is essential to explain energy allocations in the sea urchin larva exposed to experimental ocean acidification. Four Slc4 transporters were identified in the genome of the purple sea urchin, Strongylocentrotus purpuratus (Tu et al., 2012). To date, little is known regarding the function and tissue-specific localization of Slc4 transporters in the sea urchin larva. During the period of early skeleton formation in the sea urchin embryo (30–48 hr post fertilization), highest transcript abundance was detected for the SpSlc4a10 gene compared to all other Slc4 transporters (Tu et al., 2014). This gene shares highest sequence identity with the mammalian Slc4a10 (NBCn2) gene that encodes an electroneutral sodium-dependnet Cl-/HCO3- exchanger with Cl- self-exchange activity (Parker et al., 2008). This prompted us to hypothesize that SpSlc4a10 may be critically involved in HCO3- transport during formation of the larval skeleton. Here, we test the role of SpSlc4a10 in the maintenance of intracellular pH homeostasis and as a DIC concentration mechanism in the calcifying PMCs of the sea urchin embryo. Since pHi regulation is intrinsically linked to precipitation of ACC, these mechanisms will fill an important knowledge gap regarding the fundamental principles of biomineralization in the sea urchin larva. The SpSlc4a10 has widespread expression in blastula embryos at 1 day post-fertilization (dpf), including the PMCs surrounding the blastopore (Figure 1A). 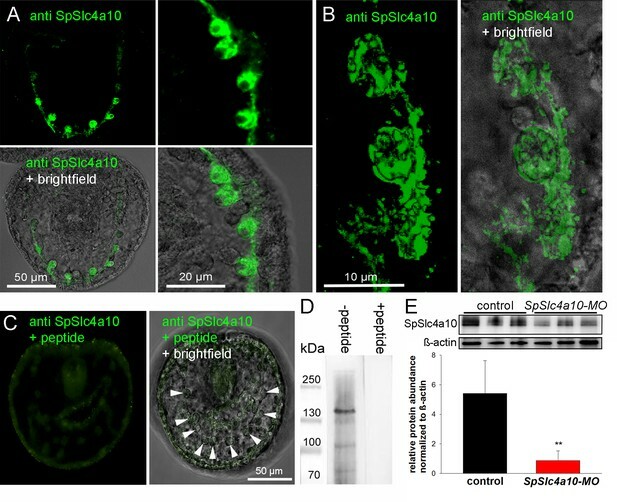 In the late gastrula (prism stage, 2 dpf), SpSlc4a10 is highly expressed in the PMCs during the formation of the syncycial cables. Besides a strong staining within the main cell bodies, SpSlc4a10 is also expressed in the syncycial cables and filopodia of PMCs (Figure 1—figure supplement 1). In the pluteus larva (3 dpf) expression of SpSlc4a10 was exclusively detected in PMCs located at the tips of the primary and secondary rods. Negative control using sense probes validate the specificity of the staining (Figure 1A lower panel). Among the four SLC4 transporters identified in the sea urchin genome (SpSlc4a3, SpSlc4a2, SpSlc4a11 and SpSlc4a10) the PMC specific SpSlc4a10 clusters within the clade of the Slc4a7-10, electroneutral Na+-coupled HCO3- transporters found in vertebrates (Figure 1—figure supplement 2). The amino acid sequence of the sea urchin SpSlc4a10 shares 44% similarity to the mammalian Slc4a10 (NBCn2) orthologue (Figure 1—figure supplement 3). 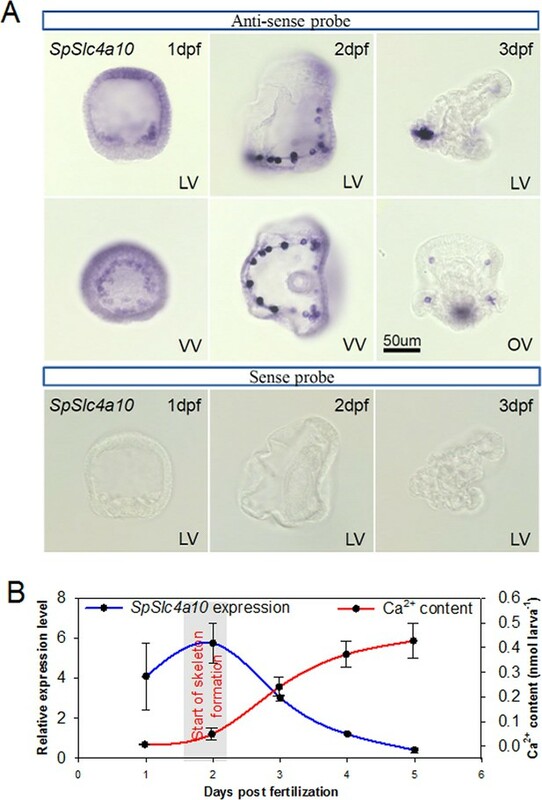 During the first 5 days of development, SpSlc4a10 expression peaks at 2 dpf, accompanied by the onset of larval Ca2+ accumulation (Figure 1C). After this, expression levels decrease, while high Ca2+ uptake rates are maintained up to 5 dpf. Expression pattern of the SpSlc4a10 gene from blastula through pluteus larva in Strongylocentrotus purpuratus. (A) Localization of SpSlc4a10 expression in the sea urchin larva along the larval development until 3 days post fertilization (dpf). Expression was detected in primary mesenchyme cells (PMCs) of the late blastula stage forming a ring around the blastopore. In the early pluteus larva SpSlc4a10 expression is exclusively found in PMCs located at ends of the spicules. (B) SpSlc4a10 expression levels and total calcium content along the early development of sea urchin larvae raised under control conditions. Bars represent mean ± SD; n = 3. dpf: days post fertilization; LV, lateral view; VV, vegetal view; OV, oral view. Light microscopic analyses using polarized light (birefringence) demonstrated a disturbed formation of the larval skeleton in morphants compared to KCl injected control larvae (Figure 2A) or scramble MO control larvae (150 µM, Figure 2—figure supplement 1). The length of the primary rod is decreased in a dose-dependent manner with increasing SpSlc4a10 morpholino (MO) concentrations (Figure 2B), while the tri-partite digestive tract develops normally. This reduction in primary rod length is accompanied by a decreased total Ca2+ content in SpSlc4a10 morphants (Figure 2B, inset). Besides the predominant expression of SpSlc4a10 in PMCs, a Na+/K+-ATPase (SpAtp1a3) and a Na+/H+-exchanger (SpSlc9a2) isoform that are mainly expressed in stomach epithelial cells are also expressed in PMCs of late gastrula and pluteus larvae (Figure 2C). A four-fold up-regulation of SpSlc4a10 expression levels in the morphants compared to control larvae at 3dpf demonstrates the specificity of the morpholino applied. In addition, SpSlc9a2 was significanly downregulated in the morphants (Figure 2D). No differences were detected for the Na+/K+-ATPase coding gene SpAtp1a3 between control larvae and the SpSlc4a10 morphants (Figure 2D). In situ hybridization using the SpSlc4a10 anti-sense probe demonstrates an irregular pattern of SpSlc4a10 positive PMCs in the morphants compared to control larvae (Figure 2E). Morphological and molecular characterization of the SpSlc4a10 morphant. (A) Light microscopic analyses with polarized light (birefringence) were used to detect deformations of the larval skeleton in SpSlc4a10 morphants (4 dpf). The tri-partite digestive tract is normally developed in the SpSlc4a10 morphants (st, stomach). (B) Length of the primary rod and total calcium content (inset) were used as indicators for reductions in calcification in 4 dpf morphants. Grey dots indicate individual measurements from experimental replicates (n = 4) (C) Expression of SpAtp1a3 (Na+/K+-Atpase; NKA) and SpSlc9a2 (Na+/H+-exchanger; NHE) in PMCs and stomach epithelial cells. (D) mRNA levels of SpSlc4a10, SpAtp1a3 and SpSlc9a2 in control and SpSlc4a10-MO injected larvae. (E) Ring formation (2 dpf) of the SpSlc4a10 expressing PMCs is disrupted in SpSLC4a10 morphants (LV, lateral view; VV, vegetal view). Bars represent mean ± SD; n = 3–4 (*p<0.05; **p<0.01). Immunohistological analyses using a costom made antibody designed against the sea urchin SpSlc4a10 protein demonstrate strong immunoreactivity with primary mesenchyme cells and their syncytial cables (Figure 3A). High-magnification confocal microscopy indicates a localiazation of the protein in the plasma membrane as well as subcellular structures within the cytosol (Figure 3B). Negative controls by blocking the primary antibody with the immunizing peptide demonstrated no unspecific binding of the secondary antibody (Figure 3C). Westernblot analyses demonstrated positive immunoreactivity of our SpSlc4a10 antibody with a 135 KDa protein which is in the predicted size range of this protein (1183 amino acids; ≈130 KDa). Western-blot analyses demonstrate decreased SpSlc4a10 protein levels in MO-injected larvae when compared to control animals validating the knock-down by our SpSlc4a10 morpholino. Localization of the SpSlc4a10 protein in PMCs and validation of the morpholino knock-down. (A) Immunohistological analyses using a custom made antibody designed against the sea urchin SpSlc4a10 protein demonstrating high concentrations of this protein in PMCs of late gastrula larvae (2 dpf). (B) High-magnification confocal microscopy showing the sub-callular localization of the SpSlc4a10 protein. (C) Negative controls were performed by blocking the primary antibody with the immunizing peptide (PMCs indicated by arrowheads) (D) Westernblot analysis demonstrated specific immunoreactivity of the SpSlc4a10 antibody with a 135 KDa protein that disappeared in the peptide compensation assay. (E) Validation of the SpSlc4a10 knock-down by quantification of protein levels using western-blot analyses. Bars represent mean ±SD; n = 3 (**p<0.01). Under control conditions (pH 8.1), sea urchin embryos increase total Ca2+ content at high rates of 1.75 nmol larva−1 day−1 during the formation of the larval skeleton (2–4 dpf) (Figure 4A). CO2-induced reductions in seawater pH by 0.4 and 0.6 pH units resulted in a reduction in developmental rates (Figure 4—figure supplement 1) associated with a reduction in Ca2+ accumulation (Figure 4A). Normalization of larval Ca2+ content to bodylength (correction for developmental delay [Stumpp et al., 2011]) demonstrated no effect on the ability to accumulate Ca2+ under acidified conditions (Figure 4B). 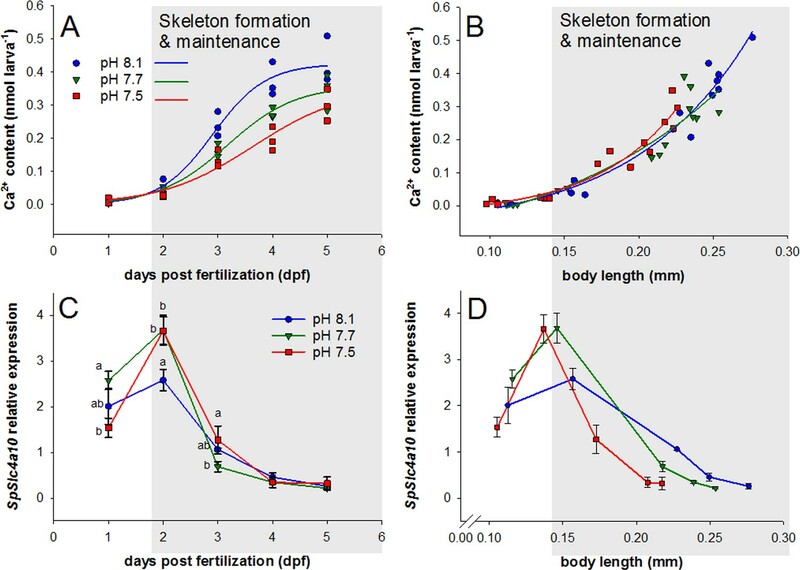 Maintained calcification of larvae under acidified conditions is accompanied by an increased expression of SpSlc4a10 at the onset of skeleton formation at 2 dpf (Figure 4C). This up-regulation of SpSlc4a10 at the onset of skeleton formation is still evident when expression levels were normalized for body length correcting for the developmental delay (Figure 4D). Development, calcium accumulation and expression of SpSlc4a10 in sea urchin larvae raised under experimental ocean acidification. (A) Total Ca2+ content of larvae raised under three different pH conditions. (B) Larval Ca2+ content plotted as a function of body length to normalize for the developmental delay caused by acidified conditions (for morphometric analyses see Supplemental information Figure 4—figure supplement 1). (C) SpSlc4a10 mRNA levels normalized to the housekeeping gene SpZ12 during development under different pH conditions. (D) Expression pattterns for SpSlc4a10 along the early development plotted as a function of body length. Different letters denote significant differences between treatments. Bars represent mean ± SD; n = 3. Intracellular pH (pHi) regulatory abilities of PMCs were assessed by real-time ratiometric fluometry using the pH-sensitive dye BCECF-AM (Figure 5A). Exposure of PMCs from control animals to seawater containing 20 mM NH4Cl evoked an intracellular alkalosis by increasing pHi from 6.8 to 7.6. A slight compensation of the ammonia (NH3/NH4+) induced alkalosis was observed during a period of 10 min. Removal of ammonia resulted in an intracellular acidosis (pHi = 6.1) that was efficiently compensated within 5 min (Figure 5A,B). SpSlc4a10 morphants had a significantly decreased pHi (6.66 ± 0.17) compared to control larvae (6.87 ± 0.13) (Figure 5B; Supplementary file 1-Table S2), and a significantly reduced ability to recover from the ammonia-induced acidosis during washout of NH3/NH4+. While control PMCs recover at a rate of 0.14 ± 0.05 pH units min−1 that of the morphants was sigificantly decreased to 0.05 ± 0.02 pH units min−1 (Figure 5B,C). Ratios were translated into pH values using the nigericin calibration method in combination with the depolarization of the membrane potential by high (150 mM) external [K+] (Figure 5D). Pharmacological experiments demonstrated that the recovery rate from an intracellular acidosis is sensitive to the anion exchange inhibitor 4,4'-Diisothiocyano-2,2'-stilbenedisulfonic acid (DIDS) in a dose-dependent manner (Figure 5E). Despite full inhibition of the DIDS-sensitive component of pHi regulation, PMCs remained capable of partly restoring pHi at lower rates in a similar fashion to that seen in the SpSlc4a10 morphants (Figure 5B,F). Intracellular pH regulatory abilities of primary mesenchyme cells. (A) Ratiometric fluorimetry in primary mesencyme cells (PMCs) using the pH sensitive dye BCECF-AM. False colour images superimposed on transmission images at time points 1, 2, 3, 4 as indicated in (B). (B) Summarized data from the control period (control (1)), after addition and removal of NH3/NH4+ (alkalosis (2) and acidification (3); ammonium pulse), and during pHi recovery (4). (C) The recovery rate of the SpSlc4a10 morphants was significantly reduced (see Supplementary file 1-table S2 for summary of prameters measured). (D) Calibration curve of BCECF-AM in PMCs obtained at different pH levels in the presence of the ionophore nigericin and 150 mM K+ allowing the translation of ratios to pH values. (E) Acid–base regulatory abilities of PMCs in the presence of 500 µM DIDS or only the vehicle (DMSO) as control. (F) The recovery rate from an intracellular acidosis is inhibited by DIDS in a dose-dependent manner with an IC50 value of 120 µM. Bars represent mean ±SD; *p<0.05 (n = 4–5 larvae with 3–5 cells measured per larvae). We tested for Ca2+ incorporation abilities in SpSlc4a10 morphants (Figure 6A,B) and in larvae treated with the anion exchange inhibitor DIDS (Figure 6C,D) in comparison to control larvae. Late gastrula stage larvae were incubated in calcein for 3 hr and fluorescence intensities monitored using confocal microscopy. In addition to skeletal deformations, calcein incorporation was decreased in the SpSlc4a10 morphants at the three different locations including posterior rod: PR (−43%), junction: JC (−31%) and anterior rod: AR (−35%). In the presence of 10 µM and 100 µM DIDS, fluorescence intensities in the three spicule sections, were also significantly decreased. Average values of different spicule sections (inset Figure 6B) demonstrated 40% and 50% reductions in spicule fluorescence intensity in the presence of 10 µM and 100 µM DIDS, respectively. Calcein pulse–chase experiments to determine Ca2+incorporation into spicules during inhibition and knock-down of HCO3- transport pathways. (A) Larvae of the late gastrula stage (2 dpf) were incubated in 160 µM calcein for 3 hr and confocal microscopy was used to determine fluorescence intensities in the spicules at different locations (posterior rod: PR, junction: JC, anterior rod: AR) after the calcein pulse. (B) Flourescence intensities are decreased in the morphants in all three locations. (C) Calcein incorporation in the presence of 10 µM DIDS or only the vehicle (DMSO) as control. (D) Fluorescence intensities, reflecting the amount of Ca2+ precipitated into spicules during the calcein pulse, decreased in DIDS-treated larvae in a dose-dependent manner (inset: intensities for entire larval skeleton). Values are presented as mean ± SD; n = 4 (with 2–3 larvae per replicate experiment: 9–11 individuals). Different letters denote significant diffrences between treatments. Same symbols used in Figure 5D indicate groups that were compared by one-way ANOVA. *p<0.05; **p<0.01. This study identified a SLC4-type bicarbonate transporter specifically expressed by primary mesenchyme cells (PMCs) of the sea urchin larva and demonstrated its role in the formation of the larval skeleton. In mammals, the SLC4 familiy can be categorized into three major clades of HCO3- and/or CO32- transporters including Na+-driven Cl-/HCO3- exchangers, electrogenic Na+ coupled HCO3- transporters and electroneutral Na+ coupled HCO3- transporters (Romero et al., 2013; Romero et al., 2004). Our phylogenetic analysis based on deduced amino acid sequences suggest that SpSlc4a10 has highest identity with the mammalian clade of electroneutral Na+ coupled HCO3-transporters, including Na+/HCO3- cotransporters (NBCn) and Na+-driven Cl-/HCO3- exchangers (NCBE) that were demonstrated to control pHi in neurons (Wang et al., 2000) and enable the transcellular passage of HCO3- across epithelial cells of the pancreatic duct and the renal proximal tubule (Guo et al., 2017; Ko et al., 2002). The human NBCn2 encoded by Slc4a10 has absolute requirements for Na+ and HCO3- and appears to be a Na+-dependent Cl-/HCO3- exchanger that is blocked in the presence of 200 µM DIDS (Parker et al., 2008). Earlier studies demonstrated that pHi regulation in PMCs is also highly Na+ and HCO3--dependent thereby supporting the involvement of an Na+-dependent HCO3- transport mechanism in the regulation of PMC pHi (Stumpp et al., 2012). 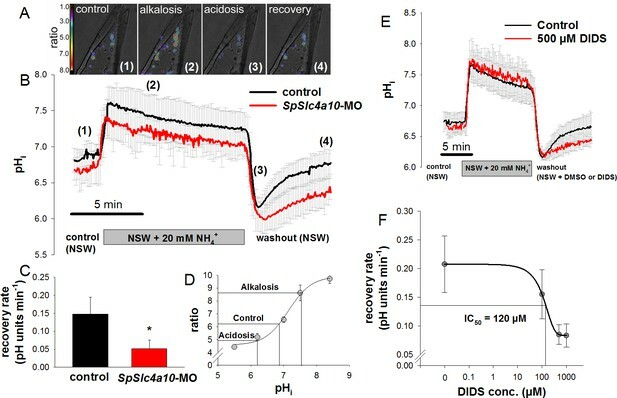 Together with findings of the present work demonstrating that pHi regulation in PMCs is DIDS sensitive (IC50 = 120 µM) and that knock-down of SpSlc4a10 reduces the ability to compensate an intracellular acidosis, there is strong evidence that SpSlc4a10 plays a central role in controlling pHi of PMCs. ACC is precipitated in intracellular vesicles which are subsequently exocytosed into the luminal space of the syncycial cable to form and maintain the larval skeleton (Vidavsky et al., 2014). Accordingly, protons generated during the formation of ACC must be removed from the vesicles into the cytosol to avoid an increasing intravesicular acidification leading to inhibition of CaCO3 precipitation. This uptake of protons into the cytosol may cause disturbances in pHi homeostasis if not actively compensated by buffering and secretion of protons. Here, the PMCs of the sea urchin larva share many common features with mammalian osteoblasts where precipitation of the calcium phosphate mineral, hydroxyapatite, is initiated in vesicles (Boonrungsiman et al., 2012). These vesicles are exocytosed from osteoblasts to deliver mineral to the protein matrix of the bone (Anderson, 2003). During mineral precipitation large amounts of acid are produced that need to be removed in order to maintain the slightly alkaline conditions at the site of bone formation (Brandao-Burch et al., 2005; Liu et al., 2011). Thus, osteoblasts also possess a high pHi regulatory capacity during biomineralization that is achieved by a basolateral Na+/H+ exchanger 1 (NHE1) and NHE6 as well as HCO3-/Cl- exchange mechanisms by the anion exchanger 2 (AE2) (Liu et al., 2011; Mobasheri et al., 1998). The present work demonstrates that similar to mammalian osteoblasts, PMCs of the sea urchin larva also possess pHi regulatory mechanisms to promote biomineralization. Highest expression of the PMC-specific bicarbonate transporter SpSlc4a10 is accompanied by the onset of skeleton formation in the sea urchin embryo and expression levels decrease in later stages that have lower calcification rates. The progressive down regulation of SpSlc4a10 is accompanied by a migration of SpSlc4a10 expressing cells toward the tips of the spicules during further development. Immunocytochemical analyses using a custom made antibody designed against the sea urchin SpSlc4a10 demonstrated high concentrations of this protein in PMCs. This suggests substantial HCO3- transport capacities by PMCs that may be associated with pHi regulation and accumulation of HCO3- to promote precipitation of CaCO3. Besides a localization of SpSlc4a10 in the plasma membrane, large intracellular compartments demonstrated positive immunoreactivity as well. In mammalian skeletal tissues AE2 has been associated with the Golgi apparatus, where it is hypothesized to control pH within the Golgi complex (Bronckers et al., 2009; Holappa et al., 2001). By controlling pH inside the Golgi, AE2 is believed to mediate posttranslational modification of matrix proteins, their packaging, transfer to the outer plasma membrane and exocytosis (Bronckers et al., 2009; Jansen et al., 2009). A lack of this protein in skeletogenic cells is often associated with osteoporosis-like skeletal defects (Jansen et al., 2009). Accordingly, future studies will address the function of the SpSlc4a10 transporter in subcellular compartments and organelles of PMCs. The disturbance of skeletogenesis in the SpSlc4a10 morphants may be due to multiple factors, including (i) disturbance of PMC migration (ii) reductions in HCO3- supply (iii) decreased control of pHi. The phenotype of the SpSlc4a10 morphants was characterized by decreased calcification abilities and abnormally formed spicules, lacking or having irregular branchings from the primary rods. Localization of SpSlc4a10 positive PMCs in control and morphants indicated an abnormal migration of PMCs. Disturbance of migratory patterns and syncytium formation has been documented in several earlier studies using pharmacological approaches. For example loop diuretics, blocking the Na+/K+/2Cl- cotransporter (NKCC) inhibited the fusion and formation of cytoplasmic cords (Basse et al., 2015). Also the H+/K+-ATPase (HKA) inhibitor SCH28080 decreased calcification through impaired PMC fusion. However, while inhibition of HKA decreased pHi of PMCs, no changes in the migratory pattern were observed (Schatzberg et al., 2015). In the present study, the disruption of cell migration in the SpSlc4a10 morphants may be explained by changes in pHi gradients that can be critical for cell polarization (Martin et al., 2011). It has been demonstrated that inhibition of NHE1, an important regulator of pHi, caused pHi gradients to flatten or disappear. These gradients serve as an axis of movement in migrating cells and so their absence would likely affect migration (Martin et al., 2011). This hypothesis would be underlined by the down regulation of the Na+/H+-exchanger (SpSlc9a2) in the SpSlc4a10 morphants. Although these are likely explanations for the observed migratory defects, intracellular pH disturbances were demonstrated to be associated with a wide range of cellular dysfunctions (e.g. Kurkdjian and Guern, 1989; Madshus, 1988; Roos and Boron, 1981) that may also systemically disturb PMC migration. The present work provides further evidence for the requirement of bicarbonate transport pathways to regulate pHi that are likely the primary cause for reduced and abnormal skeleton formation (Figure 7). We propose that reductions in calcification observed for the SpSlc4a10 morphants resulted from the decreased pHi regulatory ability of PMCs. The uncompensated proton load generated by the formation of ACC leads to an intracellular acidosis impairing futher precipitation of CaCO3. Furthermore, since 40% of the dissolved inorganic carbon (DIC) that is incorporated into spicules derives from the seawater (Sikes et al., 1981), it can be suggested that SpSlc4a10 may be also involved in a HCO3- concentrating mechanism to promote intracellular calcification. Corroborating ealier studies that demonstrated reductions in Ca45 uptake into spicules in the presence of the anion exchange inhibitor, DIDS (Yasumasu et al., 1985), the present work could show reduced incorporation of calcein in larvae treated with this compound. These reductions in calcification rates are accompanied by decreased pHi regulatory abilities under DIDS treatment. However, DIDS is a broad-band inhibitor for most SLC4 transporters, and has been demonstrated to potentially also inhibit the gastric-type H+/K+-ATPase in mammals (Sugita et al., 1999). Accordingly, it remains unresolved whether decreased pHi regulatory abilities under DIDS treatment can be attributed to an inhibition of HCO3- or H+ transport. Nonethless, the knock-down of the HCO3- transporter SpSlc4a10 caused similar reductions in pHi regulatory capacities and calcein incorporation into spicules providing strong evidence for SpSlc4a10 to be a key player controlling intracellular ACC formation in the sea urchin larva. Hypothetical model for pH regulation and bicarbonate transport in PMCs of the sea urchin larva. PMCs form a syncytium within the extraxellular matrix (ECM) that has a pH the same as sea water (SW) in which the larva develops. Amorphous calcium carbonate (ACC) is precipitated in intracellular vesicles and exocytosed to the growing calcite spicule. Dissolved inorganic carbon (DIC) is provided through endogenous (i.e. respiratory CO2) as well as exogenous (from the sea water) sources. SpSlc4a10 (NBC) is proposed to mediate the import of bicarbonate from the seawater and to buffer protons generated during the precipitation of CaCO3. Protons are exported from the vesicles through so far unknown pathways. Protons accumulating in the cytoplasm are potentially exported by the Na+/H+-exchanger (NHE) SpSlc9a2. Both secondary active transporters, NBC and NHE are driven by the Na+/K+-ATPase (NKA; SpAtp1a3) that is highly expressed by PMCs. In addition to its localization in the plasma membrane, NBC is associated with intracellular compartments including vesicles (1), vesicular networks (2) and vesicles fusing with the plasma membrane (3). n; nucleus. CO2-perturbation experiments relevant for near-future ocean acidification scenarios demonstrated that sea urchin larvae are capable of maintaining calcification rates despite reductions in seawater pH. Reductions in seawater pH were demonstrated to negatively impact calcification in many marine organisms due to a reduced availability of calcification substrates (e.g. HCO3- and CO32-) accompanied by enhanced dissolution of CaCO3 (Kroeker et al., 2013). To maintain calcification rates under acidified conditions PMCs must allocate energy to increase HCO3- / CO32- transport to the site of calcification and to export protons against steeper H+ gradients (Stumpp et al., 2012). While the concept of energy allocation toward compensatory processes (i.e. pH regulation) is widely accepted, the identification of key acid-base transporters remains largely unknown. This work has identified SpSlc4a10 as a key candidate gene that is critical for calcification under acidified conditions in the sea urchin larva. Here, we show that bicarbonate transport by a Slc4 family transporter is required for pHi regulation in sea urchin PMCs critical for the normal development of the larval skeleton. Interestingly, besides their importance in bone formation of mammals and vertebrates, the occurrence of specific bicarbonate transporters has been suggested to be a key step for the evolution of biomineralization in basal metazoans (Zoccola et al., 2015). A putative electroneutral Na+-independent Cl-/HCO3- cotransporter SLC4γ has been exclusively associated with calcifying tissues of scleratinian corals that is lacking in other non-calcifying cnidarians. Based on the findings of the present work, future studies will use the sea urchin larva as a model to identify other PMC-specific acid-base transporters (e.g. Na+/H+-exchangers) that may be critically involved in the calcification process. Here, special attention will also be dedicated to the ability of PMCs to re-absorb the larval skeleton close to metamorphosis, which is also likely associated with pH modulations in the PMC syncycium. Since pH regulation is ultimately linked to the biological precipitation of CaCO3, the present work provides a first step toward characterizing ion-regulatory mechanisms in PMCs critical for biomineralization the sea urchin embryo. This knowledge can then serve as a basis to identify conserved mechanisms of biomineralization in marine species and their potential for physiological buffering in times of rapid environmental change. Adult purple sea urchins (Stongylocentrotus purpuratus) were collected from the California coast (Kerckhoff marine Laboratory, California Institute of Technology), transferred to the Helmholtz Centre for Ocean Research Kiel (GEOMAR), and maintained in a re-cirulating natural seawater system at 11°C. Animals were fed with Laminaria sp. Spawning of males and females was induced by shaking and larval cultures were maintained as previously described (Stumpp et al., 2013; Stumpp et al., 2015). From 3 days post fertilization (dpf) larvae were fed daily with Rhodomonas spp. at a concentration of 10,000 cells mL−1. pH perturbation experiments were performed as previously described (Stumpp et al., 2012). Briefly, larval cultures with three replicates per pH treatment were continuously aerated with CO2-enriched air providing constant pCO2 levels of 400 µatm (pH 8.1), 1250 µatm (pH 7.7) and 4000 µatm (pH 7.5). Seawater physicochemical parameters including salinity, pH and temperature were monitored on a daily basis and samples for the determination of total dissolved inorganic carbon (CT) were collected at two time points. The seawater carbonate system was calculated from pHNBS and CT using CO2sys as previously described (Stumpp et al., 2013) (see Supplementary file 1-Table S3). Larval densities were determined and paraformaldehyde (4% in filtere seawater) fixed samples were collected every day to monitor mortality and morphometry of larvae along the experimental period of 5 days. The amino acid sequences for phylogenetic analyses were collected from the Ensembl (www.ensembl.org) and EchinoBase (www.echinobase.org) databases. Collected sequences were submitted to the online tool MAFFT (www.ebi.ac.uk/Tools/msa/mafft/) for alignment and phylogenetic analysis. The results of the phylogenetic analysis were plotted using the phylogenetic tree generation tool provided on the iTOL website (itol.embl.de). For molecular cloning, the transcript sequences of sea urchin SpSlc4a10, SpSlc9a2 and SpATP1a3 were PCR amplified using primers provided in Supplementary file 1-Table S4. The amplicon sequence was then cloned into pGEM-Teasy (Promega) cloning vector and used to synthesize the RNA probes for in situ hybridization. Micro injections were performed according to the protocol provided in Warner and McClay, 2014. The gene-specific morpholino-substituted antisense oligonucleotides (MO) 5`-GTTCAAGTTGTTTCTCAGTTCTCGT-3´ complementary to the start codon region of the sea urchin Slc4a10 gene as well as the srambled morpholino were obtained from Gene Tools (Oregon). The MO was dissolved in 0.5 M KCl solution and was injected into the fertilized egg (one-cell stage) using a microinjection system (Picospritzer III, Parker) mounted on an inverse microscope (Zeiss ObserverD1) equipped with a cooling stage. RNA from control and MO injected larvae was isolated by using the Direct-zol RNA MicroPrep kit (Zymo Research). RNA samples were reverse transcribed by Super Scipt IV cDNA synthesis kit (Invitrogen, Waltham, USA) for quantitative PCR (qPCR). Expression levels of the target genes were measured by qPCR using the 7500 Fast Real-Time PCR system (Applied Biosystems) and normalized to the housekeeping gene SpZ12. qPCR primers used in this study are listed in Supplementary file 1-Table S5. Whole mount in situ hybridization was performed as previously described (Stumpp et al., 2015). IF and WB analysis was performed as previously described (Stumpp et al., 2013; Stumpp et al., 2015). Briefly, for IF larvae ware fixed in 4% paraformaldehyde dissolved in filtered seawater for 15 min and postfixed in ice-cold methanol for 1 hr. The polyclonal primary antibody was generated against a synthetic peptide corresponding to an internal region (LTRHRHHKQKKKKEPENKAYNKGRRKS) of the sea urchin SpSlc4a10 protein. The affinity chromatography purified antibody was diluted 1:250 and samples were incubated over night at 4°C. After washing, samples were incubated in the secondary antibody for 1 hr, and pictures were taken on a confocal microscope (Axiovert 200M, Zeiss, Germany). For WB, 250 larvae were collected, weighted and extracted by gentle pipetting in 1:10 wt/vol of Lämmli loading buffer. Proteins were fractionated by SDS PAGE on 6.5% polyacrylamide gels, and transferred to nitrocellulose membranes (Bio-Rad), using a tank blotting system (Bio-Rad). Blots were preincubated for 1 hr at room temperature in TBS-Tween buffer containing 5% (wt/vol) bovine serum albumin. Blots were incubated at 4°C overnight in a 1:7500 dilution of the primary antibody (see previous section). After washing with TBS-T, the blots were incubated for 1 hr with horseradish peroxidase-conjugated goat anti-rabbit IgG antibody (Santa Cruz Biotechnology, Santa Cruz, CA) diluted 1:14,000 in TBS-T. Protein signals were visualized with the ECL Western Blotting Detection Reagents (GE Healthcare, Munich, Germany) and photographed with a Gel Doc 2000 system equipped with a CCD camera (BioRad). For the peptide compensation assays used in whole mount IF and WB analysis, the primary antibody was pre-absorbed with the immunization peptide at a concentration of 0.1 mg/ml for 12 hr at 4°C. Intracellular pH (pHi) measurements and ammonia pulse technique pHi determinations and ammonia pulse experiments were conducted as previously described (Stumpp et al., 2012). Control and morphant larvae were measured in an alternate mode and from each larva 4–5 cells were simultanously recorded and treated as one replicate (n = 1). Nigericin in combination with high external [K+] (150 mM) was used to calibrate pHi with our detected emission ratio of BCECF in living PMCs as previously described (Stumpp et al., 2012). For the ammonia pulse experiments, all larvae were exposed to filtered sea water (NSW) followed by the 20 mM NH3/NH4+ prepulse (NSW +20 mM NH4Cl). Acidosis was induced by washout using NSW or by using NSW containing different concentrations of 4,4´-Diisothiocyanatostilbene-2,2´-disulfonic acid disodium salt (DIDS) or 0.1% DMSO as vehicle control, respectively. To investigate the calcium content of larvae subjected to different pH levels, 50 ml of water from the larval cultures with known larval density was collected and larvae were concentrated by centrifugation. For the determination of Ca2+ content in control and SpSlc4a10 morphants 250 larvae were picked using a pipette and centrifuged to remove the sea water. Larvae were quickly washed three times in distilled water and the supernatant was removed after the last centrifugation. Samples were dried for 24 hr at 37°C. The samples were dissolved in 10 M HCl for 15 min and samples were analyzed using a flame photometer (EFOX 5053, Eppendorf). Calcium concentrations were normalized per larva and expressed as nmol larva−1. Late gastrula stage larvae (2dpf) were used for calcein labeling experiments. Control and MO injected larvae were bathed in filtered seawater (NSW) containing 160 µM calcein (Sigma) for 3 hr. For inhibitor experiments, larvae were additionally exposed to different DIDS concentrations (0, 10 and 100 µM) in the calcein solution. Vehicle controls contained 0.1% of DMSO. After 3 hr of incubation, larvae were washed four times by centrifugation and replacement of the calcein containing NSW by fresh NSW with the respective DIDS or DMSO concentration. Larvae were further incubated for 4 hr to remove calcein caught in the extracellular matrix of the larvae. Life larvae were mounted to microscope slides using synthetic cotton filaments (30–50 µm diameter) as spacers and covered with a coverslip. 5 Z-stacks images with a section thickness of 10 µm were aquired for every larva using a confocal microscope (Zeiss LSM 510) and fluorescence intensities were determined using the associated Zeiss imaging software (ZEN). Data were tested for normality and homogeneity and significance levels were analyzed using paired t-tests. For the analyses of gene expression in CO2-treated larvae as well as comparisons of calcein fluorescence intensities in morphants and DIDS-treated larvae one-way ANOVA followed by Holm-Sidak post-hoc test was used. Regression analyses were performed on log transformed data using linear models. ANCOVA followed by the Holm-Sidak method was performed to test for sigificant diffrences in Ca2+ content under different CO2 treatments. Statistical analyses were conducted using Sigma Stat 13 (Systat Software). Comparative Biochemistry and Physiology Part A: Molecular & Integrative Physiology 187:184–192. Proceedings of the Royal Society B: Biological Sciences 264:461–465. The Journal of Cell Biology 102:1878–1886. Ver Phys Med Ges 34:145–176. Journal of Experimental Zoology Part B: Molecular and Developmental Evolution 312B:375–387. Philosophical Transactions of the Royal Society B: Biological Sciences 368:20120439. Journal of the American Society of Nephrology : JASN 28:2409–2419. Journal of Histochemistry & Cytochemistry 49:259–269. Annual Review of Plant Physiology and Plant Molecular Biology 40:271–303. Journal of Cellular Physiology 226:1702–1712. American Journal of Physiology-Cell Physiology 300:C490–C495. Journal of Biological Chemistry 283:12777–12788. Molecular Aspects of Medicine 34:159–182. Pflugers Archiv European Journal of Physiology 447:495–509. Comparative Biochemistry and Physiology Part A: Physiology 70:285–291. Comparative Biochemistry and Physiology Part A: Molecular & Integrative Physiology 160:320–330. European Journal of Pharmacology 365:77–89. The Journal of Biological Chemistry 275:35486–35490. In: D. J Carroll, S. A Stricker, editors. Developmental Biology of the Sea Urchin and Other Marine Invertebrates. New York: Humana Press. pp. 211–223. Thank you for submitting your work entitled "A SLC4 family bicarbonate transporter regulates intracellular pH critical for biomineralization in the sea urchin embryo" for consideration by eLife. Your article has been reviewed by three peer reviewers, and the evaluation has been overseen by a Reviewing Editor and a Senior Editor. The following individuals involved in review of your submission have agreed to reveal their identity: Martin Tresguerres (Reviewer #1). Our decision has been reached after consultation between the reviewers. Based on these discussions and the individual reviews below, we regret to inform you that your work will not be considered further for publication in eLife. However, should the authors address the concerns raised by the reviewers with respect to experimental controls and specificity, we would entertain a revised paper in the future. This would take the form of a new submission, linked to the previous one within the system and would be assessed by the same experts. This study attempted to characterize the involvement of the bicarbonate transporter SpSlc4a10 in sea urchin larvae calcification. The hypothesis was that SpSlc4a10 is preferentially expressed in primary mesenchyme cells (PMCs), which are responsible for calcification, where it alkalanizes intracellular pH (pHi) to promote calcification. The study also addressed the potential involvement of SpSlc4a10 under ocean acidification (OA)- like conditions. The topic is important and timely because information about molecular and cellular calcification mechanisms in marine organisms is scarce, and because this is essential for understanding and predicting potential effects of OA. The choice of experimental organism is excellent because sea urchins have very well characterized developmental biology and genome, and genetic manipulations are possible. Unfortunately, this study has one major flaw in that the specificity and efficacy of SpSlc4a10 morpholino knockdown was not validated. Figure 2D shows a 4-fold upregulation of SpSlc4a10 mRNA, however this is not a reliable validation. In addition, those larvae had significant NHE downregulation (which would also explain the results). It is likely that mRNA levels for other ion transporting proteins that were not examined were also up or downregulated. This makes it impossible to attribute the effects to SpSlc4a10. The gold standard would be to determine protein abundance using validated antibodies; SpSlc4a10 protein level should be reduced. Antibodies against SpSlc4a10 would have the additional advantage of determining subcellular localization -i.e. basolateral or apical membrane, or intracellular calcifying vesicles. If making antibodies is not possible, a second morpholino against another region of the SpSlc4a10 gene should be used. Alternatively, CRISPR-Cas9 or siRNA could be used. In any case, control "scrambled morpholino" should be used and those larvae must be used for at least some of the key experiments. Unfortunately, skeleton defects is a very common phenotype seen in stressed sea urchin larvae, so determining a specific effect on calcification requires very carefully controlled experiments. Another issue is the use of DIDS. While it is true this drug inhibits bicarbonate transporters, it is very broad so it will inhibit all bicarbonate transporters (not just SpSlc4a10). Furthermore and even more worrying is that DIDS has multiple and significant off-target effects, which explains why cutting-edge biomedical research has stopped using DIDS at least a decade ago. For example, DIDS inhibits the H+/K+-ATPase at concentrations as low as 1μM (Sugita, et al. 1999). One way to circumvent this problem would be to assess the effect of DIDS on cells from sea urchin larvae morphants (which should not be sensitive to DIDS). Moreover, the effects of DMSO (the vehicle for DIDS) on pHi should be determined. Unless these issues are resolved, I will not provide further feedback about the experiments or conclusions. I repeat this is a very interesting and important topic, and that the choice of experimental organism is excellent. However, the issues listed above must be addressed. This manuscript suggests that a member of the SLC4 HCO3 transporter family, SpSlc4a10, has an important role in pH regulatory and HCO3 concentrating mechanism is sea urchin. This is a very interesting and important information relating to the biomineralization mechanism in animals. This is a very elegant and well design experiment, the authors studied each relevant aspect that HCO3 transporter can affect. This manuscript addressed the role of bicarbonate transport in developing sea urchins, in particular on biomineralization. The manuscript is well written and easy to follow. The manuscript supports a key role of the bicarbonate transporter slc4a10 in pH regulation and biomineralization processes in developing sea urchin. The only real problem with the manuscript is a logical gap as to why the research has chosen to focus on slc4a10 as opposed to any other bicarbonate transporter of sea urchins? The data do support a central, but not unique, role of slc4a10 in the processes mentioned above. 1) Fig, 1B is too small to be of value. It should be greatly increased in size and included as a figure supplement. 2) Figure 1C needs an X-axis label (presumably time). 3) Subsection “Expression pattern of the sea urchin SpSlc4a10 bicarbonate transporter”, first sentence. The term "ubiquitous" may be too strong. Perhaps "widespread" would be better supported by the data. 4) The manuscript does not provide sufficient text rationalizing the focus on slc4a10, to the exclusion of other bicarbonate transporters in sea urchin. Please explain why the analysis was confined to this transporter. 5) Figure 2 legend and elsewhere: Ideally legends should explain the experiment, but not interpret the results. The phrase "demonstrate developmental defects in the formation of the larval skeleton in the pluteus larva (4 dpf)" clearly belongs in the Results section, not legend. Same issue arises in panel D and E legend. Please revise this and other legends accordingly. 6) The established convention in the SLC4 field is that NBC refers to "sodium bicarbonate co-transporter". Family member SLC4A10 is an electroneutral transporter called NBCn2, as the second recognized electroneutral sodium bicarbonate cotransporter. If the sea urchin gene product studied here is orthologous to mammalian SLC4A10, it may very well share the same transport function. If so, that function is electroneutral sodium dependent Cl-/HCO3- exchange. This point should form part of the introduction. Moreover, in the manuscript where the term "NBC" is used to described slc4a10, NBCn2 might be preferable. The manuscript needs to provide the evidence in the form of amino acid sequence alignments or literature citations that identifies the gene under investigation as orthologous to SLC4A10. 7) The third paragraph of the Discussion would be enhanced by citing literature discussing the myriad effects of pH on cellular function. So powerful is the effect of pH that it is difficult to assess the mechanism by which it acts. We would like to thank reviewer #1 for a generally positive but also critical review on our manuscript. We spent a lot of time and efforts to carefully address and resolve all issues raised by reviewer #1, which has significantly increased the quality and scientific value of this work. We were able to generate and validate an antibody raised against the sea urchin SpSlc4a10 protein. Using this antibody we validated our MO-knock-down by western blot analysis and could confirm our in situ hybridization experiments demonstrating that also the protein of SpSlc4a10 is exclusively located in PMCs. We performed additional experiments using scrambled morpholinos to demonstrate that skeletal defects can be specifically attributed to the SpSlc4a10 MO. In addition, in the context of another project, we are currently working with several other MOs targeting proteins expressed in the endoderm of the sea urchin larva. Using these MOs we found no skeletal defects making us very confident that skeletal deformations and reductions in calcification seen in this study can be attributed to the specificity of our SpSlc4a10 MO. We also explained the rationale for choosing DIDS in our pharmacological experiments and the implications of these observations for the research community. We agree with reviewer #1 that a compensatory expression, by increasing SpSlc4a10 mRNA levels in morphants, merely represents a weak validation for the specificity of our knock-down. According to the reviewer´s suggestion we now included additional experiments to validate the specificity of our SpSlc4a10 knock-down by demonstrating that protein levels are decreased in SpSlc4a10 morphants. We generated a polyclonal antibody designed against AA205-231 (LTRHRHHKQKKKKEPENKAYNKGRRKS) of the SpSlc4a10 protein of the purple sea urchin (Strongylocentrotus purpurtus). Western blot analyses demonstrate specific immunoreactivity of our SpScl4a10 antibody with a 130 KDa protein which is in the predicted size range, and which is similar to the molecular weight of the mammalian Slc4a10 orthologue. 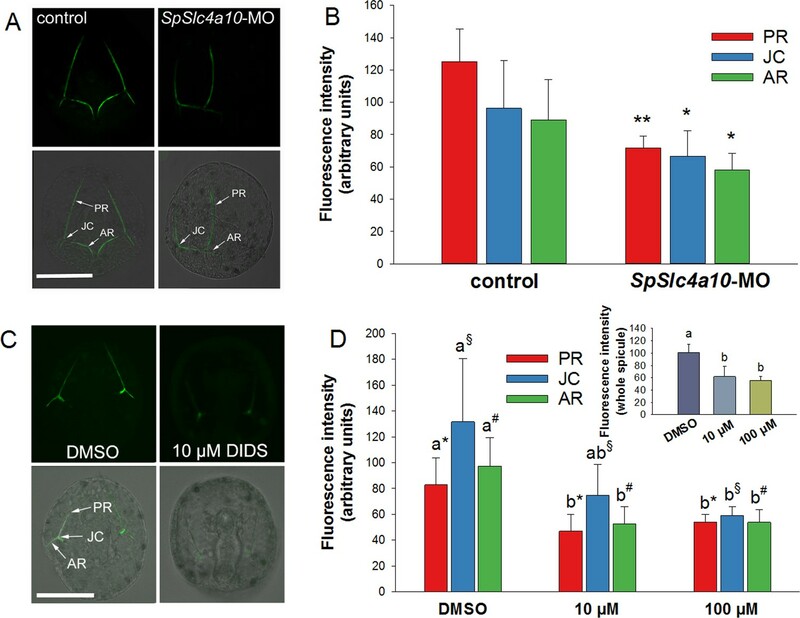 SpSlc4a10 protein levels are significantly reduced by 70% (normalized to ß-actin) in morphants compared to control larvae. Immunocytological analyses demonstrate high concentration of this protein in primary mesenchyme cells and associated filopodia. The protein is localized in cellular membranes as well as in the cytosol (vesicles). We added this data as a new figure (Figure 3) to the revised manuscript and added the respective paragraphs to the manuscript describing and discussing these new findings. We used “scramble morpholino” at the same concentration as we applied our SpSlc4a10 MO and could not detect any morphological defects during larval development. We added a new supplemental figure to this work comparing primary rod-length in KCL and “scramble-MO” injected larvae (Figure 2—figure supplement 1). Furthermore, using other MOs (at the same concentration) targeting endodermal genes we did not find skeletal defects underlining the specificity of skeletal deformations in our SpSlc4a10 morphants. We agree that DIDS is a rather broad-band compound inhibiting most Slc4 transporters and potentially also other transporters relevant for pH homeostasis. There are two main purposes why we used DIDS in addition to our specific knock-down of Slc4a10. First, this inhibitor has been used in studies addressing the formation of the larval sea urchin skeleton (Yasumasu et al. 1986 Exp Cell Res 159:80-90). These studies demonstrated skeletal deformations and the authors concluded the involvement of HCO3- transport in the biomineralization process with the underlying mechanisms remaining unresolved. In this way the present work helps demonstrating that DIDS affects pHi regulatory abilities that are likely responsible for skeletal defects in the sea urchin larva. Second, based on our previous studies demonstrating that pH regulation in PMCs is HCO3- and Na+ dependent, we used DIDS to provide a complete chain of evidences (Na+, HCO3- manipulations, pharmacology and morpholino knock-down of SpSlc4a10) demonstrating the importance of HCO3- transport in pHi regulation. In our controls we always added the vehicle (DMSO) at the same concentration as in the ones with DIDS. We have this information in the Materials and methods section as well as in the respective figure legends. We appreciate that reviewer #1 sees the importance and timeliness of this work and hope he is satisfied with the revised version now including the requested experiments. We are grateful for the positive and constructive comments made by reviewer #3 that significantly improved the quality of our manuscript. We addressed and accepted all concerns raised and corrected them in the revised version of our manuscript. In particular, we explained our rationale for choosing SpSlc4a10 out of the six Slc4 transporters annotated in the sea urchin genome (see comments below). Furthermore we corrected all legends in that we now focus on explaining the experiments rather than describing the data. We also separated the Introduction and Discussion into shorter focused units and added a paragraph introducing the function of the mammalian NBCn2. We hope reviewer #3 is happy with the revised manuscript and we would like to once again thank him/her for constructive criticism. We enlarged Figure A2 and moved it to the supplemental material part. We added the axis label (days post fertilization). We agree with the concern raised by reviewer #3 and carefully corrected and rephrased all respective figure legends. We added information regarding the function of the mammalian NBCn2 to the introduction. We carefully checked our text and replaced Slc4a10 by NBCn2 where necessary. We also added an amino acid sequence alignment of the human NBCn2 and the sea urchin SpSlc4a10 to the supplemental part (Figure 1—figure supplement 3). © 2018, Hu et al.